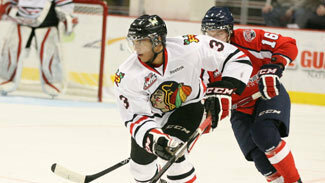 TORONTO – Seth Jones took his first strides as a hockey player in Colorado. Based on the fact the Colorado Avalanche won the 2013 Scotiabank NHL Draft Lottery on Monday, he may take his first strides as an NHL player there too. Jones, a defenseman for the Portland Winterhawks of the Western Hockey League, is the No. 1 ranked prospect by NHL Central Scouting. The 2013 NHL Draft will be held June 30 in New Jersey and the Avalanche, who beat the odds with an 18.8-percent chance to win the lottery, is certainly in the market for a big, offensive defenseman. For the first time in four years, it will not be the Edmonton Oilers stepping up to the microphone to announce the first pick of the draft. The Oilers collected Taylor Hall, Ryan Nugent-Hopkins and Nail Yakupov with the No. 1 selection the past three summers. "It is a very, very exciting night for the franchise for sure," Avalanche general manager Greg Sherman told NHL.com. Sherman did not attend the lottery, sending the team's director of amateur scouting, Rick Pracey, to Toronto instead. The Avalanche finished 29th this season at 16-25-7, three points ahead of the last-place Florida Panthers. Florida had the greatest odds to get the first pick in the lottery at 25 percent. It was a turbulent season for the Avalanche, beginning with the contract dispute with center Ryan O'Reilly and ending with the dismissal of coach Joe Sacco. But with forwards O'Reilly, Matt Duchene, Gabriel Landeskog and PA Parenteau, the Avalanche have a solid foundation from which to build. "Clearly, given the talent we have on this team right now, we're adding another elite prospect to the solid foundation that we have," Sherman said. "It is certainly a big day for the franchise; it's a big night for our fans and we're very excited about the outcome tonight." Jones, who helped the United States win the World Junior Championship this year and is playing with the Winterhawks in the WHL playoffs, is a blue-chip prospect expected to make an immediate step into the NHL next season. The son of former NBA player Popeye Jones had 14 goals and 56 points in 61 games this season and was ranked ahead of Halifax Mooseheads forwards Nathan MacKinnon and Jonathan Drouin at Nos. 2 and 3, respectively. "There's a lot to like about Jones," Pracey said. "His size and skating ability are two things that jump off the page and are attention-grabbers, but his ability to rush the puck and make decisions coming out of the D-zone to create offense from the back end has our attention. He's an individual that brings two-way ability, size and reach." Pracey also praised MacKinnon and Drouin. "Drouin is a skill-set type of player who makes others around him better," Pracey said. "His ability to make plays and create chances are very good. His offensive ability will translate at the NHL level. We think he is very talented with great instincts. MacKinnon is more of a power-play [guy] and his skating is elite. We think he comes to the rink and approaches and plays the game the right way. We like his intensity and his energy." Pracey said picking Jones first "is not a slam-dunk decision by any means." Florida general manager Dale Tallon took things in stride. After making the Stanley Cup Playoffs last season, the team struggled in 2012-13, with injuries certainly playing a role in its 15-27-6 campaign. Tallon had his heart set on getting the No. 1 pick, but knows his Panthers will end up with a high-end prospect. "It reduces the pain if you get the top pick because we went through hell this year," Tallon said. "It would have been nice to get it, but picking second, we know we're going to get a hell of a player. Sometimes it takes the heat off … the pressure off you going to the draft. It would have been nice to get the top pick, but either way we know we're getting a good player." The most recent defensemen chosen No. 1 -- Erik Johnson (St. Louis Blues, 2006) and Chris Phillips (Ottawa Senators, 1996), are solid players, but not star players. The Blues passed on productive forwards Jordan Staal, Jonathan Toews, Nicklas Backstrom and Phil Kessel to choose Johnson. The 1996 draft was regarded as weak and it is somewhat ironic the best player from that class was another defenseman, Zdeno Chara, chosen 52nd by the New York Islanders. "Clearly, given the talent we have on this team right now, we're adding another elite prospect to the solid foundation that we have. It is certainly a big day for the franchise; it's a big night for our fans and we're very excited about the outcome tonight." This year's lottery was the first in NHL history in which all 14 clubs not qualifying for the Stanley Cup Playoffs -- or the clubs that have acquired the first-round drafting positions of those non-playoff teams – had a chance at winning the right to the No. 1 selection. In seasons past, only the bottom-five teams had a crack at the top pick. The Tampa Bay Lightning had a 14.2 percent chance of getting the top pick. The other teams who had an opportunity were: Nashville Predators (10.7), Carolina Hurricanes (8.1), Calgary Flames (6.2), Edmonton Oilers (4.7), Buffalo Sabres (3.6), New Jersey Devils (2.7), Dallas Stars (2.1), Philadelphia Flyers (1.5), Phoenix Coyotes (1.1), Winnipeg Jets (0.8) and Columbus Blue Jackets (0.5). Four No. 1 picks – Gil Perreault (Buffalo, 1970), Denis Potvin (N.Y. Islanders, 1973), Dale Hawerchuk (Winnipeg, 1981) and Mario Lemieux (Pittsburgh, 1984) -- went on to win the Calder Trophy as the NHL's top rookie and were elected to the Hockey Hall of Fame. Three others – Bobby Smith (Minnesota, 1978), Bryan Berard (Ottawa, 1995) and Alexander Ovechkin (Washington, 2004) -- were named top rookie. Berard was traded to the Islanders before playing a game in the NHL.